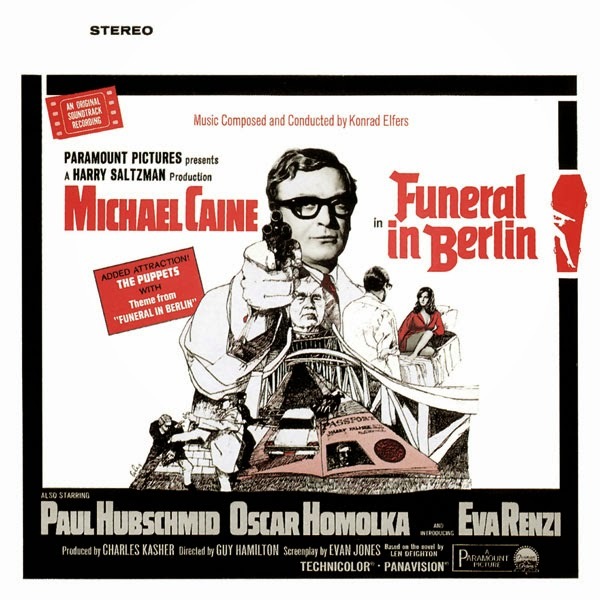 For the 1966 Paramount film Funeral in Berlin, famed Bond producer Harry Saltzman hired veteran German pianist and composer Konrad Elfers to provide the follow on score to John Barry's effort for the first film, The Ipcress File. Elfers wrote a score that sits comfortably between the works by Barry and Richard Rodney Bennett (who would compose music for Palmer's third film, Billion Dollar Brain), combining the requisite jazz/big band sound of spy movies with a mix of classical and modernistic orchestral music that evoked the historical and modern aspects of the film’s setting in Berlin. The original RCA Victor LP boasted an unusually comprehensive presentation of Elfers’ score at around 39 minutes of music. This expanded Intrada version features all the album cues—including two that were dropped—sourced from 1/2” three-track masters. Funeral in Berlin was directed by Guy Hamilton, who had made Goldfinger, the most popular Bond film to that point. The plot has Harry Palmer (with Michael Caine reprising the role having first played it in The Ipcress File) assigned to facilitate the defection of a Russian colonel, whom Palmer immediately suspects has another agenda. In fact, Stok is using Palmer to expose and eliminate an operative who has been facilitating defections from the Soviet Union. Palmer’s Berlin contact and friend initially aids Palmer, but after an attractive model attempts to seduce Harry, Palmer discovers that she is an Israeli agent in pursuit of a former Nazi in possession of money stolen from Jewish victims by the Third Reich.